Buckingham County: Horse Breeding | slate river ramblings . . . . In central Virginia, offering stud services was a common source of extra income. Even this short-term business required a license. In 1797, for example, Randolph Jefferson paid 15 shillings to the Buckingham County taxman for keeping a stud horse at his farm, Snowden. On May 30, 1854, A.W. and W.J. Fontaine ran the following advertisement in the Richmond Whig & Public Advertiser. 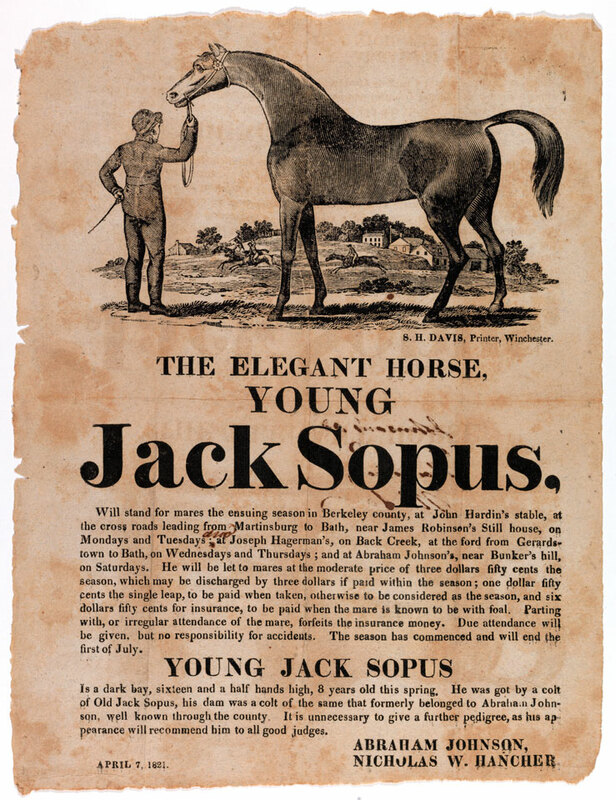 Broadsides (like the one above) were likely posted throughout the county, announcing the many virtues of the breeding stallion — Star of the East. STAR OF THE EAST. – This well known Stallion will stand the present season at Diana Mills, at Buckingham Court House, Virginia. These two stands are as many as we wish him to attend. He has seen much service, and has acquired a reputation for Blood, Action and Beauty, that should prompt any man, who really wants a colt worth having to obtain his services. We will not impose on his good nature, nor to disparagement to his celebrity by peddling him about. Persons sending a distance will send to Diana Mills, Buckingham as we have excellent pasturage, and will furnish grain, if desired, at a small extra charge. No responsibility for accidents; but the utmost pains taken to prevent their occurrence. TERMS: Insurance $30 [$38? ]; season $15; and single leap, $10. One dollar to groom, except the mare be from a distance. I hadn’t heard a lot of that horsey terminology. I get a kick out of it! Broadsides are so much fun! Buckingham County Horse Breeding: Young Red Eye | slate river ramblings . . . .